Welcome to October! I hope you have been enjoying your fall! Mine has been jam packed with lots of fun. There are so many amazing things going on at Stampin’ Up! sit back and read all about it! From October 1–10, 2017 select stamp sets are 15% off plus there is a special on Notecards and Fast Fuse too! Check out all of the details on the link above and order from now until the 10th for these great deals! Plus, buy Fast Fuse Adhesive (item 129026) and get TWO Fast Fuse Adhesive Refills for FREE!To get your free refills, add Fast Fuse Adhesive to your order (item 129026); two Fast Fust Adhesive Refills will automatically be added to your order and the listed price for the refills will show as $0.00. DSP Sale – Buy 3, Get 1 Free! Right Now, from October 1st – October 15th you can add the Stampin’ Blends to your Ultimate Bundle. What’s that? Well, the Ultimate Bundle is the fabulous kit offer that Stampin’ Up! offers. For $99 + tax you can take home $125 worth of product with no penalties for never ordering anything else after that time. 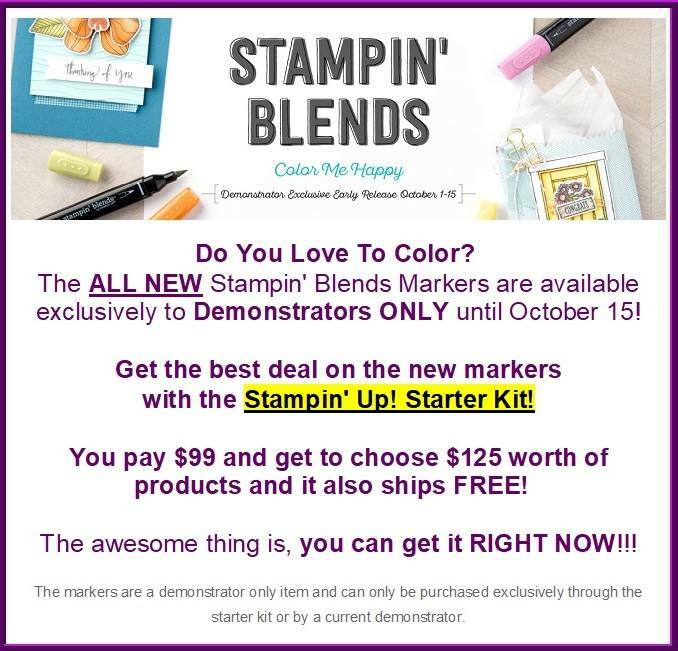 Contact me now to find out how you can take these new Stampin’ Blends home with you soon! Join Me Now! Shop anytime at: Stampin’ Jackie, plus right now if you add the Host Code: BJWEYGHH to your order and if you spend $75 or more I will send you a free gift, up to a $10 value! It’s like getting a present just for snatching up your wish list items! Check out the fabulous Shares I have going on now! I am offering a Designer Series Paper Share, a Ribbon and Trim Share, and an Embellishment Share!